Everyone in Pine Bluff knew them as the Woodfield sisters. One never married and the other one...well, she discovered she married a no-good drunk so, after a few years, she divorced him and moved back with her spinster sister. Both sisters worked almost all of their lives, one as an insurance secretary and the other as a sales lady at Froug's Department Store. Over time, as they grew older and had medical problems, they stopped working but continued to go to church regularly and take banana nut bread-their speciality- to shut-ins and friends. Women loved my Daddy and the Woodfield sisters were no exceptions. They met him when he remodeled their bathroom. The younger sister, recently diagnosed with serious eye troubles, needed a shower rather than their old bathtub from the forties. They chose my father to do the work and....from that time forward....he was their best friend. Over the years, as the sisters grew older and their incomes grew smaller....they weren't able to attend church regularly, or visit the sick as often so.... fewer people received their delicious gifts of banana nut bread. Money wasn't their only problem. Although their old car sat in the driveway, ready to go, finding someone to drive the car became an ongoing dilemma for the sisters. The older sister had never learned to drive and now...younger sister was blind. Although the sisters maintained their charming ways, their elegant appearances, and their concern for others, public buses just weren't the accepted manner of travel for classic ladies and....taxis were too expensive. Southern women almost-always appear delicate on the outside but inside, they are notorious for being Strong as Steel. The Woodfield sisters absolutely-fit that description. Never to be under-estimated, the sisters decided that transportation should not be a problem. They were convinced that "where there's a will, there's a way." One afternoon, my father was in the front yard, trimming his rose bushes when he heard the roar of an old car rounding the corner at a high rate of speed. He looked up to see a vintage Buick racing into our driveway--completely out of control. Daddy yelled "STOP"..Just in the nick of time! With a loud screech, the brakes locked and the driver brought the car to a shuddering halt....inches from the sde of our house. Before Daddy could reach the car to see if anyone was hurt, the driver's window lowered and "Sister" Woodfield greeted my father with a big smile, a loving hello, and a loaf of banana nut bread. Imagine Daddy's surprise when he learned that younger Sister Woodfield--totally blind--- had driven the Buick from her house, all the way across town to our house! 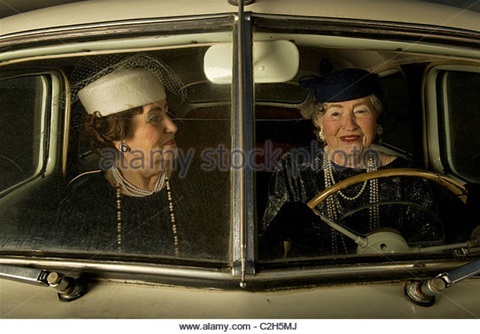 It seems the sisters had been practicing for weeks to co-ordinate their new driving technique. Although the younger sister was blind, she still felt "quite at home" behind the wheel. So, older sister became the co-pilot, directing younger sister as to when to stop, turn, move away from parked cars, speed up or slow down, and to help her avoid the curb. Older sister was so excited as she explained how the two of them were able to both drive the car with great success. She said they'd always worked well together, and now....they were an outstanding driving team. Older sister thought they should share their dual driving discovery with Arkansas's School For the Blind. She explained how her ability to name streets and sense distances worked perfectly to guide younger sister as she "drove" across town. She described a typical trip in the car, like this: "Sister, we're on seventeenth street, just about a-half a block from Cherry Street so start slowing down. Remember, Johnny always parks his car close to that fire plug in front of the Triplett home there on the right so....watch out. Okay, Hit the brake NOW, sister! STOP Completely! Okay, there aren't any cars coming either way so now, sister.... step on the gas!" After that scary incident, my father insisted on "adopting" the Woodfield sisters so they would never drive again. In fact, he helped them find a buyer for the Buick and they made a little money. From that day forward, someone in our family was always available to chauffeur the sisters where ever they needed to go. They were now "part of the family." In addition, my Father discouraged the sisters from introducing their dual driving technique to the state's blind school since neither of them had ever had a driver's license.